Michelle Nicastro has a wide array of credits that span television, film, Broadway, recording, and beyond. Michelle made her Broadway debut in the not-so-magical Merlin. She was there When Harry Met Sally. She made soap bubbles in Santa Barbara. 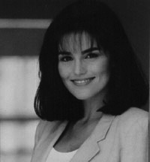 She won audience and critical acclaim for her year and a half as Eponine in the Los Angeles company of Les Miserables, and she even dubbed the singing voice of “Callisto” for the memoralbe “Bitter Suite” episode of Xena. All the while, she was recording four albums with Bruce Kimmel: Toonful, Reel Imagination, Toonful, Too, and On My Own. DL: Let’s start talking about how you got into show business. You do so many different things – television, movies, music… When you started, did you have an idea that you wanted to do any one specific thing? MN: To be honest with you, I was kind of confused. I didn’t know quite which way to go, and I remember I was looking at colleges and I thought about maybe going into the music department. However, even though I had studied some opera, I really didn’t want to become an opera singer, and that was really all they offered at these schools. And I remember talking to a person at Northwestern University, where I eventually ended up going, and they said, “Well, you really have to think. Do you want to be a singer who acts or an actor who sings?” That just brought it into focus for me, and I thought I’d rather be an actor who sings. That way it could help me in a lot of different directions.